Olga Yunter was born in July 1900 in a remote frontier post in southern Siberia. A girlhood played out against the backdrop of the China trade changed forever, when, at seventeen, Olga joined her brothers in their fight against the Bolsheviks. This book gives an account of a woman's life lived at the heart of the twentieth century. 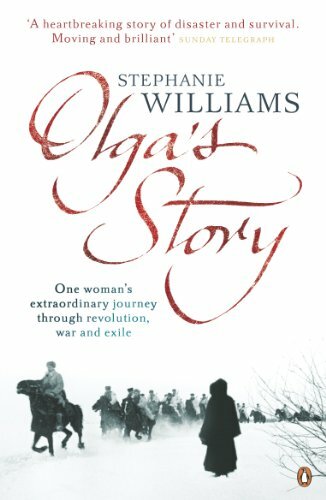 Stephanie Williams's Olga's Story is the moving account of a woman's life lived at the heart of the twentieth century.Olga Yunter was born in July 1900 in a remote frontier post in southern Siberia. A girlhood played out against the backdrop of the China trade changed forever, when, at seventeen, Olga joined her brothers in their fight against the Bolsheviks. Death and retribution followed. Olga was forced to flee to China, rubies sewn into her petticoats. Twice more Olga would be forced to leave everything behind - first to escape Mao's Communists, and again when Japan invaded China during World War II. From the comfort of her family to the terror of revolution, war and exile, Olga's Story is the heartbreaking tale of the author's grandmother. 'A heartbreaking story of disaster and survival through some of the worst conflicts and upheavals of our benighted age . . . moving and brilliant' Sunday Telegraph'A gripping and authentic narrative of a life that was at once ordinary and remarkable' TLSStephanie Williams has spent the last ten years piecing together her grandmother's story. A journalist and author of two works of non-fiction she lives in London.